Still have some questions? Can´t find your answers on our website? No worries – it happens! Here are some answers to a few asks we often receive. 1. Why did the Fund convert to a corporation? On December 31, 2012 the Pizza Pizza Royalty Income Fund (PPRIF) was converted to Pizza Pizza Royalty Corp. (PPRC) and all unitholders became shareholders on a one-for-one basis. In 2007, the federal government amended the Income Tax Act (Canada) to include the Specified Investment Flow Through tax provisions, or SIFT Tax, which is an entity-level tax on Canadian publicly listed income trusts, including the Fund. The Fund became a taxable entity effective January 1, 2011. As a result of the SIFT Tax, the Fund’s taxation rate is equal to the rate applicable on income earned by a Canadian public corporation. The SIFT Tax reduces the Fund’s amount of cash available for distribution to unitholders. An additional rule under the SIFT Tax provisions allows enties such as the fund to convert from an income trust to a Canadian corporation on a tax-deferred rollover basis if the conversion is completed prior to January 1, 2013. The Fund took advantage of the tax-deferred rollover option by converting to a corporation (PPRC). Other reasons for conversion include increased clarity in financial statement presentation plus greater financial flexibility going forward.The key terms and economics reflected in the partnership agreement and all other agreements between Pizza Pizza Limited and the Pizza Pizza Royalty Limited Partnership will not be affected by the corporate conversion. PPRC and the Partnership will continue to operate independently from Pizza Pizza Limited, the private operating company. 2. What relationship exists between Pizza Pizza Royalty Corp. (“PPRC”) and Pizza Pizza Limited? Pizza Pizza Limited (“PPL”) is a privately held company that is the licensee of the Pizza Pizza and Pizza 73 trademarks owned and licensed by the Pizza Pizza Royalties Limited Partnership, a subsidiary of PPRC. 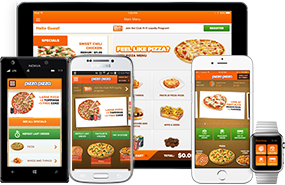 PPL continues to be the franchisor of Pizza Pizza restaurants in Canada, providing management consulting services to Pizza Pizza franchisees and owns 50% of all Pizza 73 traditional restaurants. PPL also holds securities exchangeable for shares of PPRC that if exchanged would give PPL a 23.0% interest in PPRC. The number of shares that PPL is entitled to receive upon exchange of these securities should, in the absence of restaurant closures, increase as new locations are added to the Royalty Pool. 3. What is meant by the term “payout ratio”? Very often you may hear the media speak of payout ratios when discussing royalty entities. The ratio is used to judge an entity’s health and ability to meet its obligations, including its dividend payment. A payout ratio is calculated by dividing the Company’s annual distribution per share by adjusted annual earnings per share. Restaurant royalty companies, historically, have tended to have higher payout ratios than oil and gas companies since restaurant royalty companies are not exposed to operating and capital expenditure requirements. 4. What is PPRC´s payout ratio? For the twelve months ended December 31, 2015 the payout ratio was 95%. PPRC has accumulated a cash reserve to cover seasonality and any unforeseen administrative costs with the source of the reserve coming from the percentage of earnings not distributed. Our payout ratio will always be relatively high, since we do not have capital expenditures or employees. Net profit generated after taxes, interest and administrative expenses is available for distribution. Therefore, after establishing a resonable cash reserve, the majority of net, monthly cash generated is available for distribution to shareholders with the final decision resting with the Board. 5. What is the current dividend and when is it paid? The current dividend is 7.13 cents per share per month, or $0.8556 per share per year. Dividends are paid on the 15th day of each month. Dividends are set by the Board of Directors and are reviewed monthly. For a Canadian taxpayer, dividends are eligible dividends and will be subject to 100% taxation for 2016, without a return of capital component. 6. What is PPRC’s trading symbol? Pizza Pizza Royalty Corp.’s trading symbol will be PZA; it’s very close to the symbol under which the Fund traded which was PZA.UN. Beginning in 2013, PPRC dividends are 100% eligible taxable dividends (Canadian taxpayers). For Canadian taxpayers, in 2012, 67.5% of the distributions paid by Pizza Pizza Royalty Income Fund was taxable as an investment income and 32.5% was considered a return of capital. Foreign shareholders should consult your tax advisor. 8. How will the taxable portion of the dividends be communicated to Shareholders? Beginning with 2013, dividends paid by PPRC will be fully taxable as eligible dividends. All Shareholders will receive a T5 silp on which the dividend will be detailed. In 2012 and prior, all Unitholders received a T3 slip on which the taxable portion and return of capital portion were separated and detailed. For 2012 distributions, 32.5% is treated as a return of capital and 67.5% was treated as a taxable eligible dividend for Canadian taxpayers. 9. Why is the December dividend, which is received on January 15 of each year, not included in the prior year´s T5? The income reported on the T5´s provided to Shareholders of record on December 31, 2016 will not include the dividend for the period December 1 to 31, 2016, as dividends are recorded on the payable date, not the declaration date. Prior to 2013, the distributions paid monthly by the Pizza Pizza Royalty Income Fund were recorded on a T3 slip. T3 slips record income based on declaration date. Hence, in 2012 Unitholders of record on December 31, 2012 would have received a T3 slip containing the December 1-31, 2012 distribution, which was received in January 2013. 10. When will dividends be increased further? At the initial public offering units traded at $0.80 per year per unit. Distributions were increased six times from July 5, 2005 to December 31, 2010 at which time the annualized distribution equaled $0.93. Effective January 1, 2011, the Fund’s trustees adopted a new distribution policy that reflected the Fund’s obligation to pay SIFT tax. The 2011 distribution was reset at $0.70 per unit. Since 2011, the dividend has been increased seven times. Effective May 2012, the Fund announced a 2.7% increase in its monthly cash distribution, then in January 2013 the Company increased its dividend 4.2%, and in June 2013 increased it another 4%. In January 2014, the Company increased the monthly cash dividend 2.6%, again in April 2015 by another 1.9%, and again in November 2015 by an additional 2.5%. The most recent dividend increase was in June 2016, when the Company increased the monthly cash dividend 2.4% to $0.0713 per share. or $0.8556 annually. Same store sales growth is the driver of shareholder yield growth. 11. On which stock exchange are PPRC’s shares traded? Shares trade under the symbol is PZA on the Toronto and Alpha Stock Exchange. 12. How can I find PPRC’s current trading price? A 15-minute delayed price fund information is available on the homepage of this website or by logging onto tsx.com. Unit prices are also quoted in most major Canadian newspapers. 13. How many shares of Pizza Pizza Royalty Corp are currently outstanding? There are currently 24,618,392 publicly traded shares outstanding and 31,967,706 shares outstanding on a fully diluted basis. At January 1, 2019 Pizza Pizza Limited owned 7,349,314 equivalent shares accounting for the difference in the publicly traded and fully diluted. 14. How can I purchase PPRC shares? Shares are traded on the Toronto Stock Exchange under the symbol PZA. To purchase shares please contact your brokerage firm. 15. What is the interest rate on the $47M credit facility? The Corp has a $47 million term loan with a syndicate of Chartered Canadian Banks. The $47 million term loan has an interest rate locked in at 1.875% plus a credit spread of 0.875% for a total of 2.75% using an interest SWAP until April 2020. 16. Does PPRC have a Dividend Reinvestment Program available to Shareholders? No. A dividend reinvestment program, or `DRIP”, is a mechanism that allows investors to elect to receive dividends (or distributions in the case of income trusts) in securities as opposed to cash. The company paying the dividend/distribution retains the cash that would have been paid for reinvestment. In essence, a DRIP equates to periodic small offerings of shares or units by the company or fund. Alternatively, most brokerage firms offer a feature similar to a “DRIP” which allows investors to rollover monthly cash distributions for additional shares. 17. Are new Pizza Pizza and Pizza 73 Restaurants added to the Royalty Pool? On January 1 of each year (the “Adjustment Date”), an adjustment is made to the Royalty Pool to “vend-in” new Pizza Pizza restaurants that have been opened, less any restaurants which have closed, by the December 31 and for new Pizza 73 restaurants that were open on or prior to September 1 of the previous year, less any restaurants which have closed, prior to that Adjustment Date. At each adjustment date PPRC pays PPL, in securities exchangeable for shares, 92.5% of the amount reflecting the value of any increase in the royalty at that time. The adjustment for new restaurants added to the Royalty Pool is designed to be accretive to current shareholders due to the 7.5% discount in payment to PPL. As of January 1, 2019 there are 772 restaurants in the PPRC´s Royalty Pool, comprised of 660 Pizza Pizza restaurants and 112 Pizza 73 restaurants. This number will change with the next January 1 adjustment date. 18. What incentive is there for Pizza Pizza Limited to increase the top-line restaurant sales? The interests of Pizza Pizza Limited and shareholders are closely aligned as PPL owns 23.0% of the fully diluted shares of PPRC. As well, new restaurants are vended into the Royalty Pool annually for which PPL is compensated in equivalent shares based on the License and Royalty Agreement. Details can be found in the Annual Information Return or on sedar. 19. Why is there an accumulated cash reserve? Since the initial public offering, a reasonable reserve has been maintained to smooth out distributions, to guard against abrupt economic downturns and/or unforeseen administrative expenses. 20. What is Pizza Pizza Limited´s ownership in PPRC? Effective January 1, 2019, PPL owns the equivalent of 23.0% of the shares of PPRC on a fully diluted basis. The percentage may change with each January 1 Adjustment Date when new restaurants are added to the Royalty Pool of restaurants. 21. Why is there a difference in the number of restaurants in the Royalty Pool and the total number of restaurants reported by PPL? The number of restaurants in the Royalty Pool is adjusted once a year on January 1 to include the royalties from restaurants which opened in the prior year less closed restaurants. Therefore at any given time there may be restaurants which have opened after January 1 and are not in the Royalty Pool until the following January 1. 22. How can I contact the Pizza Pizza Royalty Corp.?